Bunker Hostel is a place where you will feel home. 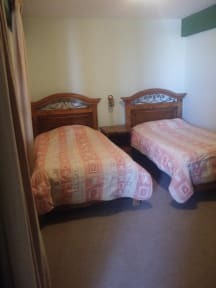 We offer nice rooms with comfy beds, hot showers, clean toilets, tv in the rooms, Wi-Fi connection and yummy breakfast. Our receptionist speaks good English and we have a travel information desk. The Hostel also have a Restaurant – Bar with good prices and tasty food for you, delicious drinks and themes night, we offer good offers and happy hours every day! 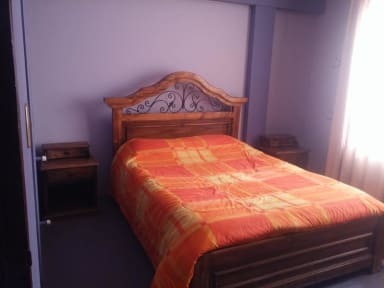 Bunker Hostel is located in the centre of Uyuni next to the train station, in front of the Arce Square, 3 blocks from the bus station and 10 minutes from the airport. Close to the Hostel, you can find many super markets, drugstores, souvenirs stores, tour operators and restaurants so we are located in centre of the centre. Bunker Hostel have nice private and shared rooms with comfortable beds, hot shower, clean toilets, good wi-fi connection, and a nice breakfast in the morning. Check in from 12:00 to 23.00. One of the best breakfasts we've had so far! Kind staff and really clean rooms. Wifi not too good, but fine for messages and some research work. Showers took long to get warm, but are nice! Breakfast was amazing!! Guys from the hostel helped us with everything. Nelson even gave his number in case we needed something. Clean, nice and wel organized hostel! The people working in Bunker are very friendly and try to help you with anything you need. Also our room was very clean and the breakfast was A DREAM! Would definitely recommend! Goed bed, fijne douche, lekker ontbijt. Wat wil je nog meer! Prima hostel voor nacht in Uyuni voor/na de tour. Lekker ontbijt met pancakes! Very bad bad wifi. The rest is fine. We had a double room which was basic but spacious. Overall this place is good value for money. The only negative thing that I can say about this place was that our room was extremely moldy and had a damp feel. The smell was unpleasant coming in and we had to change pillows as they were really smelly. All and all we slept perfectly after a three day tour coming from San Pedro the Atacama, Chile. Beds were good. Bunker hostel is next to the main square of Uyuni and close to all tour operator offices. The hostel itself is okay, although there isn’t really a common area. If you want to meet new people, it’s not the best place to go. The rooms are okay, but ours did smell like mold a little. Vieze bedden, vieze badkamer, vieze lakens.. pluspunt: Warme douche, redelijk goedkoop. Na de tour hoopten we op een schoon verblijf in een lekkere warme kamer. De kamer was koud, had vieze bedden en een ranzige badkamer. Vooral de wc-bril was smerig, bij het zitten op de bril komt er oud water uit de sponzige bril omdat het douche gordijn mist. Ook het bed is enorm ingezakt.. Aanbod in Uyuni is echter minimaal. This hostel was nothing more than a decent place to stay. Ok if you’re looking for that, but i expect more from a hostel.